It is possible to grow potatoes in raised beds but they do take up a great deal of space and they will need supporting. Far better though is to grow potatoes in containers. You can move the containers around to the best position for the sun. Potatoes also use lots of water which is much more easily applied when in their own container. The other big advantage of growing potatoes in their own containers rather than the raised bed is concerned with soil contamination. Potatoes are one of those vegetables where it is essential that they are not grown in the same soil every year. In a normal crop rotation plan, potatoes would only be grown in soil used for a previous potato crop every four years. If you grow potatoes in the same soil more frequently than that you risk them suffering from pests and diseases. So, when growing potatoes in containers always use fresh compost. 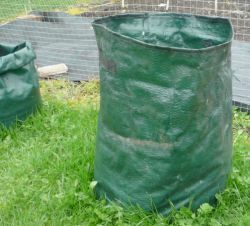 Incidentally, we also grow tomatoes in grow bags which is simply a different form of raised bed. By doing this we keep two of main culprits of soil contamination, potatoes and tomatoes, out of the formal raised beds and therefore significantly reduce the complexity of crop rotation. We have previously mentioned that potatoes in containers can be moved around to maximise their exposure to sun, that's just one benefit of growing potatoes in containers. The key advantage though is that you can start potatoes in containers off a few weeks earlier compared to those grown in the ground or a raised bed. The reason container potatoes can be started off early is that if a frost threatens, the container can be moved to a protected position until the risk of frost has passed. Potatoes will grow even in cool conditions, albeit slowly. But expose the foliage to even a degree of frost and it will turn black. It is true that as long as the tubers have not been frosted the blackened foliage will die off and new foliage is likely to appear. But the potato crop will then be significantly delayed. If the tubers have been affected by frost then the entire crop can be lost. This can be a complicated if you want to have potatoes over a long season. However, if this is your first year of growing potatoes in containers then choose one variety of "early" potato and one "maincrop". The quickest potatoes to mature. They take anywhere between 60 to 105 days from planting to harvest. How quick they mature depends on the weather conditions and the variety. Most will mature in 80 to 90 days. One very early maturing variety which we recommend is "Casa Blanca". Ready for harvest in around 65 days / early to mid June. Lady Christl is another good one which matures in around 70 days / mid to late June. Lady Christl has been awarded an AGM by the RHS which confirms its all round excellence. In 2018 we trialed Vitabella in large grow bags and were astonished at the results. They look great and taste even better. Disease resistance appears high when grown in containers. But most surprising of all was that they started to crop in late June and we made our last harvest well into November. We heartily recommend this variety. The medium season potato type which will take 105 to 120 days from planting to harvest. As far as particular varieties are concerned we leave it up to you to choose. Our firm favourite for general kitchen use is Kestrel. The take the longest to mature but they produce the largest crop and they store much netter than early potatoes. Many people say that it is pointless growing your own maincrop potatoes because the shop bought ones are so cheap. That may well be true but grow your own maincrop potatoes and you know exactly what they have been sprayed with - nothing! The simple joy of eating your own home grown potatoes is good for the soul, whatever the economics. Maincrop potatoes take between 125 to 140 days from planting to harvest. There are endless varieties so choose one that suits you. We regularly grow King Edward's as a maincrop but that's only our personal choice. The choice of containers for growing potatoes in is almost endless. Type in "potato container" or "potato grow bag" into your favourite search engine and the options returned are bewildering. The key requirements for a container to grow potatoes in are that is has drainage holes at the bottom, it is big and deep enough to produce a meaningful crop from at least one seed potato and that the sides can retain the compost. The shape (round, square even triangular) is irrelevant. The size can range from a large pot 20cm wide by 30cm deep up to a large dustbin sized container. It all depends how many potatoes you want to grow and how much space you have available for growing potatoes in containers. Our particular choice is a reinforced plastic type bag (see the picture) which is about 35cm wide and 70cm. That's enough for two or three seed potatoes and we can still move it relatively easily. We use three of these at any one time. 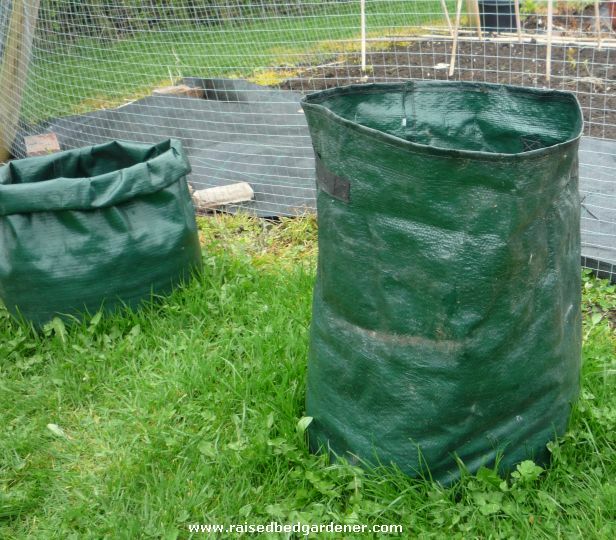 Use general purpose potting compost for growing potatoes in containers. Yes you can use John Innes type composts or a mixture of the two but we have not found that it improves our crops. Never use garden soil for growing any plants in containers. Now you know the advantages of growing potatoes in containers it's on to the business of chitting and planting them, caring for them and harvesting them. Either click on one of the headings below to go straight to that subject or click on "next potato page" to read the next page in this series on growing potatoes in containers.